Integrated system of 170 engineering trainings! Engineer training system implemented by the company includes over 170 both open and closed courses. Our training offer fulfills the needs of modern industry, guarantees top quality and the highest level of satisfaction with the training services provided by the company. Training sessions take place in our modern specialist laboratories adapted to the needs of particular trainings. Each training room and technical laboratory is equipped with teaching aids enabling the participants to do practical exercises. Our tutors are representatives of different branches of industry and members of academic staff with long-standing experience in production and industry. Each training sector is divided into „paths” of acquiring skills on different levels of courses – from the basic issues to more difficult topics and specialist knowledge. Participants receive professional documentation in the form of textbooks, technical documentation, instructions and other publications. There is also the option of using materials and diagrams provided by the client. Participants are entitled to participate in free extra classes on the chosen days, after the scheduled classes. We also provide support and help within the topics included in the courses in your everyday work. Trainings organized by The Engineering Training Center EMT-Systems help your employees become aware and self-reliant when it comes to solve problems on particular positions. We focus on practical exercises and application of our tutors’ knowledge backed up by real-life examples. As a rule, 30% of time is devoted to theoretical training and 70% of time is designated for all active forms of participation – workshops and exercises which allow the participants to gain practical skills of operating machines and systems. We have introduced two types of courses: open and closed. Such a solution provides the participants with the opportunity of choosing the best option. Open courses are aimed towards individual participants while closed courses are dedicated to firms. Each participant can rate our services after completing the course. Comments received in the questionnaires are used to improve the quality and standard of our trainings. After completing the course each participant receives a certificate of participation signed by the authorized persons. 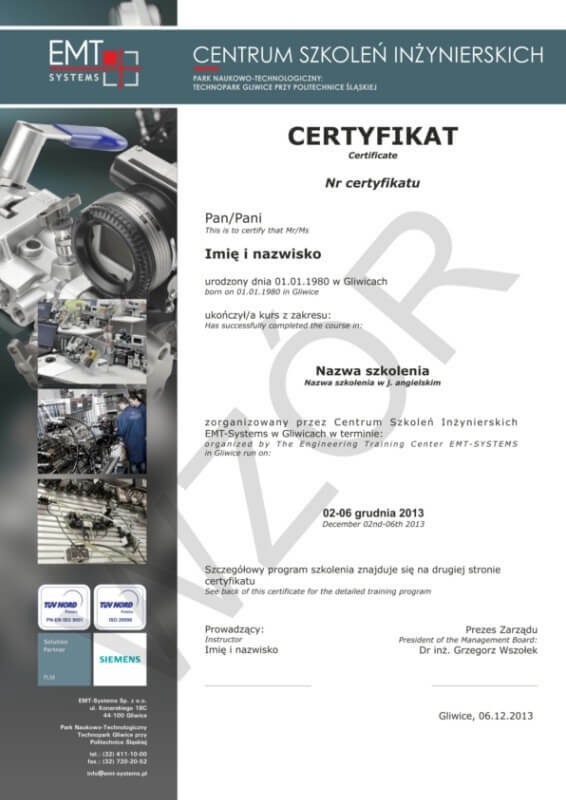 Certificate, both in Polish and English, includes the course program. If need be, it is also possible to prepare a certificate in the language specified by the participant. For courses carried out in our training rooms we provide daily coffee breaks, hot and cold drinks, cookies and two course lunches.